Goisi Beach (碁石海岸) is one of the popular beach of Iwate, located in Ofunato. It has great view of huge rocks that are created by the erosion of sea water. There are many unique rocks, caves and gate. Also, this beach has unique ball shape stones that is like "Igo Stone." There are hiking trail that you can enjoy the beautiful scenery. Ranboya is a small valley that has giant view with the sound of thunder. 1. use local bus to Goishikaigan. Goishi Beach is about 3km long costal line with great view of ria costal sight located in a Matsuzaki peninsula of Ofunato. There are many great view points with giant rocks, caves and gates that were created by the erosion of water. This is the part of Sanriku Fukko National Park. 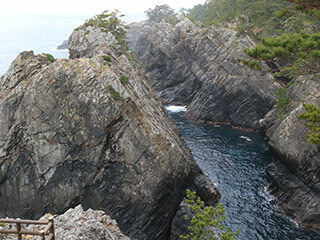 Kaminariiwa, or thunder rock, named for the deep rumbling sound produced when waves recede after striking caverns in the rock and compressing the air inside them. It is recognized by the Ministry of the Environment as one of 100 Soundscapes of Japan. Ranboya Gorge is the canyon-like channel running between the sheer 30m walls of Kaminariiwa Rock and the peninsula cliff it faces. Anatsuiso is a huge rock with three gate opened for sea. It is locate Goishi Beach, Ofunato, Iwate prefecture. Goishi Beach is Ria Coast with many valley, rocks, gates and caves. There are Ofunato History Museum is located nearby.